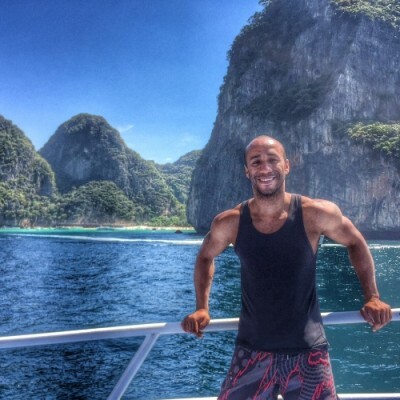 Brazilian Boxing Champion, Athlete, International Ambassador at International Boxing Group, Professional Boxer at Associação Nacional de Boxer and World Traveler, Adriano Dos-Santos talks, about travel, winning, losing and hoping. Adriano Dos-Santos, thank you for joining us today. I’m really interested in this conversation. You have shared hope with me in the past. We met on a trip and you are a boxing champ or Brazil. I believe you actually won the Brazilian title. If I’m not mistaken, you’re a phenomenal translator and you’re doing a lot of photography, you lead a lot of tours, you’re still training, and you’re still training yourself and also training competitive fighters and just an instantly hopeful person. You can meet somebody every now and then and they just light the room up and light up whoever’s around them and Adriano that is you, so thanks for your time today and I’m looking forward to the conversation. Tell me a little more about you and then I’ll jump into the questions. Thank you. It’s my pleasure to be here, to be able to be a part of this awesome project that you have. A little about me, as you have said, I’m from Brazil, I’m a professional boxer. That’s the reason why I came into the United States and ended up in Las Vegas. Actually, I was never to leave the US, but Las Vegas. So, I weren’t supposed to be in Miami, had a little trouble in Miami, got a bus from Miami all the way to Vegas, five days later and no English, I was in Vegas with a backpack and full of hope and dreams. That’s all we got. I had a lot of dreams and a lot of hope that things would be alright. At the end of the day it did because I did what I came here to do, I boxed, I trained and back home I won the national title, I was Brazilian champion as professional, I won three times. I fought for the South American, I fought for the Latin American title. I didn’t lose the South American, but didn’t win, didn’t get the title for political and no show reasons with the promoter. Then, we’re here in Vegas. It’s been 14 years I’ve been here. I love the city. I like people that I met over here, I like everyone and I don’t know. I think that’s a little bit about me. I have a long story. If I’m going to talk about it, it’s going to be a lot. Actually, there’s a funny thing that I would like to talk about too. When I got here first, I had my issues. The guy that was supposed to meet me at the airport wasn’t there. He was in Vegas and I had to come to Vegas, I didn’t speak English, I didn’t have enough money to come to Vegas and he told me to get a bus to have a fight in the United States. It would be really cheap. So, since I speak Spanish too, my main language is Portuguese, I went to the information in Miami. In Miami, everybody speaks Spanish, so I don’t have to worry about English technically. That’s what they say. So, I was sent to the Greyhound, which was the best bus system I would ever see in my life as he states. So I got into Greyhound and five days later I was arriving in Los Angeles because my money wasn’t enough to come to Vegas, but I never lost hope. I was going to be in Vegas. I’ll make it to Vegas. Miami to Los Angeles, so five days and my money wasn’t enough. Yes. The thing is I had after – I arrived, I bought a phone call, I had $200. Everything was paid for. I should stay in Miami to train, so I had $200 in my pocket just to by little things because I will stay three weeks and go back home. I arrived, I bought a card that was $5, so $195 and I bought a bottle of Coca Cola. I don’t drink soda anymore, so I wouldn’t go to that problem. It was $2.50, so $192.50, I had. I had to take the bus, another $2.50, so $190. When I arrived at the bus station, I think it was $189 to come to Vegas and it was five days. I had $190. And you had $190 left. Oh wow. I’m like, $189, five days, $1 left, I’m not going to be able to eat. So I said, how much to Los Angeles? And they’re like, oh, to Los Angeles was $165 I think. It was around that. It was close, so I said okay I’ll go to Los Angeles. It was something close enough to that. It was enough money so I could buy something to eat in between. It seems like Los Angeles would be more expensive than Las Vegas. It seems farther away. It was November 16 when I arrived here. I don’t know exactly what happens in Vegas in November. There was a big convention that makes some things more expensive. I think that’s why things were more expensive at that time here. The tickets coming here. For some reason. I figured that out later in my years. So you still had $30 or $40 or you had like $25 left to eat. Yes. So, it was $25. I thought about buying bread and milk, but it was like – because I did backpacking things before. No backpack except when going to training camps and I was in a rough life when I go training boxing. Nothing is the way you think it would be. With that money, I thought I could buy milk and bread, but milk is going to go bad in five days, so I’m not able to buy milk. I’m going to buy water. Instead of buying bread, I bought sweets because they’re going to feed me. I did it that way and I met this guy on the bus station who was from Cuba. He rode two days on the bus with me and he was explaining to me how things worked and telling me that if you get out of the bus when I’m not here, you stick around with the driver. Anywhere the driver goes, you go with the driver. Don’t leave the driver. Don’t let him go away because if you leave and the bus leaves, they’re not going to give you a refund. You’re going to lose your money and lose your ticket and you’re stuck. So, I was the driver’s shadow. Anywhere. He would go to the bathroom, I would go to the bathroom. He would go eat, I would go eat. Everything he was doing, I was doing. I was with him. He would look at me like, man you’re crazy– no, I don’t speak English. Sorry. He was like, well whatever. The creepy guy in the bus. The creepy Brazilian guy. I remember on the first day when we were leaving Miami, during the first couple of hours in the bus, this guy, I remember seeing his face because the bus stopped by a police checkpoint and this guy was just like the guy I saw in the movie. He was so white that he was red because he was under the sun all day and his eye was blue like really blue. He pointed to the bag and he pointed to the people, pointed to the bag coming all the way from the front. He got to my row, pointed to the bag, pointed to the Cuban. The Cuban said, yes is there something else? No, it’s okay so like, okay. So he looked at me, no, he said yes – something and then didn’t know what he said after. Then the guy looked at me, pointed at the bag, pointed at me and I said yes? He said something else, so yes and then he put his hand in his gun and the Cuban looked at me like, he just asked if you had drugs and you said yes. I was like, no, no, no, no. He was like, where are you from? Brazil. Let me see your passport, so my passport. Oh you’re a boxer. I looked at the guy, the Cuban translated to me saying, yes he’s a boxer. So you’re going to Las Vegas? I looked at the guy, yes Las Vegas. That was the awkward moment in the beginning. He was like, okay, you have no drug on your bag? The guy told me and I said, no, no drugs. Can I check and I said yes. I was being translated at that time, but he didn’t check and said okay, I’ll leave. He went out to the door, started going down the stairs, stopped, came back close to me, looked at the guy just pointing and told him not to say anything. He looked at me and asked me the same questions, but I didn’t remember the questions. Do you have any drugs? I’m like, yes and he started laughing and left. He just wanted to hear you say it again. He just asked me again if I had drugs and I said yes. I don’t know what he was saying. But then five days later I arrived in Los Angeles, called the dude and sent me Western Union money after screaming at me saying why I’m in LA. I slept one day in the bus station and got the first bus to Vegas the next day. That’s how everything started. That’s how you got to America. That’s amazing. I’m glad you made it. I tell everyone, I didn’t come in a boat. I didn’t swim because I don’t know how to swim. I had a long ride in the bus. Yes you did. That’s great man, that’s a great story. Well, you got more stories coming, so question number one about hope. Question 1: What’s your definition or favorite quote about hope? Definition of hope is like to never give up. It’s like you’re always looking forward for something in your life. As we say in Brazil, in Portuguese, “a esperança é a ultima que morre” which translates to “hope is the last thing that dies”. At the end of the day, when your hope dies, everything else dies. If you don’t hope to have something else, you don’t have the mindset, that thing in your head, you live for nothing and you’re done. Wow. You’re right. You’re really right. That’s a great way to say that. Question 2: Who’s shared a lot of hope with you? Who’s been the best giver of hope in your life? Tell me about her. Why is she such a powerful giver of hope? Who is she? That’s great. That’s awesome to have a parent like that to really instill that in your heart and to really give you a chance. I mean she’s mean. She would yell at me and beat me and slap me when I did wrong things, but that’s the best part of it. I think that’s what made me what I am today, that I can see the things that I see. I think I lost a lot of the ways that I had before. I would always see something as a positive, even the bad things, I would stop and say hold on – even the story when I got here and everything went wrong, I would look and hold on, there’s a chance to make it right or go somewhere else. I would never give up on something, but I think through the years, we get more and more into the – especially being in Vegas, more into the money, more into the properties and things and we lose a little bit of the heart. I think I caught myself on the right time and trying to go back or trying to be the way I am now, not letting anything else change who I am. That’s the original me. I have to keep it that way. It’s so true. Money and friends and peer pressure. Just trying to be somebody else really does change us. It’s good to go back and be who you really are. Question 3: When has been a time in your life when you’ve really had to lean hard on that hope of just not quitting, not letting hope die? What’s going on back there where you’ve really had to fall back on hope? It was something that happened when I was 17 or 18, I think, that we had to find another place to live. It was really a hard time because my mom was out of job. I was hurt and wasn’t competing. I was really hurt because I broke my jaw. I was back with the jaw, but I couldn’t compete, so I wasn’t getting paid for. We had a really hard time finding a place to stay. She got a place to stay and I went to stay a little bit in my gym where I used to train. I decided to stay at the gym for a while after that and that was the first time I left home. That was the time we thought everything was going to be bad and that’s the point where we look and say, now there is no way that we are going to get anything to happen, there’s no way we’re going to be able to. I was believing that no, we got to do it. Something’s going to happen. When you hope – I think hope is a feeling. I don’t know if it’s a feeling. I don’t know how you can describe hope, but it’s something so strong that I was hoping that something would go right. It was at that point that I got called to be the sparring partner of a friend of mine that was a really good boxer, one of the top boxers of Brazil. They called me to spar him and when the payment came in advance, I was able to get my mom a place. We rented a house, she stayed in a house. Now, we own where she lives. I bought something for her. Wow. That’s sweet. It’s sweet of you to do that. It’s a great story of something coming in the last minute when you’re really, really down and you need some help. Yes. Sometimes you just look at it and there are times that you think there’s no hope. Sometimes something so severe happens and in a way you just think that it is the end and you’re not going to be able to do something else. It’s like, now I’m done. I can’t go anywhere, I can’t find a way. But, it is always that way. It’s like when in you’re a dark room or if you’re in a room with no lights and you open your eyes, you can’t see. You’re just seeing the darkness because the light’s not there. You don’t see nothing in nothing, so there has to be something in it. I think that’s the way you got to look at it. You got to look at the darkness, find the light and follow it. Go ahead. Go get it. That’s a good point. So, the only way we know that it’s dark is because we also know that there really is light out there. There has to be light. You have to have contrast even though it’s dark. Question 4: How are you sharing hope today? What are you doing in your life today to deliver hope to yourself or to other people? How do I share hope today? You mentioned, when we met a few weeks ago, some things you were doing when you get to go home once or twice a year. Every time we go home at the end of the year, even if I’m not there, we have a toy drive that we started. Actually, we started with the food. We are four friends, we get our money and buy a bunch of food and give it to the people that don’t have anything. We would give it to the people, just a small amount, they would get food or toys. It would have a little bit of food, but still we do the toy drive. It’s not a toy drive. It’s just like park somewhere and the kid get their toys. That’s how we do it. We’re too lazy to walk around with the toys, so they have to come to get it. The best thing that we did one time, I was there and one of my friends started to date somebody there who was working on a TV station in Brazil. This girl just told her friend about it who told their friends and told their friends and at the end of the day, the idea was on the director of the TV himself. They had a really huge event that day because everybody gave something. They had sponsors giving baskets with Christmas food for people and clowns and Santa Claus. It was one of the best. It was in 2011. That was the best that we had. The other years, we went back to the same way we did before, but that was the best of the best. That’s really great. That’s really a good idea. That’s such a practical, easy thing to do. Also, you didn’t have to get fancy. At first, you just started collecting toys and give it away. I just started collecting and giving something back and somebody else sees and it’s good to help and we grew the network like that. You know, the story of I guess Santa Claus has become Santa Claus or Saint Nicholas or however all that started, sounds kind of familiar. Evidently, the traditional beginnings of that is you just start collecting some stuff, giving it to kids and making sure they had something and it just got bigger and bigger. That’s pretty awesome. I don’t usually give money when I walk. Like homeless people, they ask for money, I don’t give money, but I offer them food. I don’t mind stopping my car and going – I remember one day I was driving and it was cold. The guy was asking for money. I was going to work and I asked him, you want to eat? Because I didn’t have money. I had my card. He was like, yes, yes I want to eat something. It’s like, okay let’s go to McDonald’s and he said, no I am not able to. I can’t get into the store. They don’t let me go into the store. I was like, yes, you’ll get into the store, and you’ll go with me. He’s like, no, no I’m dirty. You’re going to the store. So he got in to the store with me and the lady on the counter said he can’t stay here. I was like, he’s going to eat. I’m going to eat here. He’s going to stay here because I’m paying for it. Oh, we can’t allow him to stay here because the other customers are going to feel bad. It’s not my problem. I’m paying for it, so I want him to stay here with me because I’m buying his food. Can we sit in the corner, all the way to the corner away from everybody? Are you sure? I said yes. So I sat down at the corner, they gave him the burger and you can see the tears in his eyes and he was like, thank you. Thank you. It’s just food. We don’t know about tomorrow and life is a coin, it has two sides. Today, we’re on one side, tomorrow can be another side. I don’t deserve that, I don’t wish that to anybody, but I don’t know. We never know tomorrow. I think we should treat people as well as we want to be treated in any circumstance, in any way. Great points. Thanks for sharing all that. Question 5: What can we do, if I’m learning to be a more hopeful person or share more hope, what should I start doing? Give me some simple steps. What do I do right now? Learn how to be hopeful. I think that’s a good way to start it and then we go move into how to share it with other people. If you can’t do it for ourselves, you’re not going to be able to do it for somebody else. No matter how good a heart we have, if we’re not able to stop and think about everything we do, how we do and how things are, there are good days, there are bad days, but the worst that life can be to us, there’s somebody else out there who has a harder life and they are doing their best to be happy and wait for a better future. We have to look at things in different ways. Two ways like what is bad today is not the worst because we are alive, we are breathing, we are walking, we are talking, we are seeing and we have all the opportunities in life as long as God lets us wake up in the morning and go do our chores, do our daily tasks. We are alive, we have to have the hope that every day is a new day and every morning is a new moment and every day is going to be better, tomorrow is going to be better than today. Today is better than yesterday and after tomorrow is going to be better than tomorrow and so on. How we share that with other people is just being positive. If you show your positive energy to anyone and if you take the good deeds with you, like a smile, sometimes you don’t need much to share hope. You just need to smile. A smile is a powerful thing. It can make somebody else’s day the best day of their lives. If you see someone down and they see a really true smile, there’s a difference of smiles and you have a real smile through something that comes from your heart. Sometimes those little things, they help a lot on somebody else’s lives, somebody else’s day. Be positive. We got to see life as the best thing that we have because it is actually the best thing. There’s a little quote, I don’t know where I heard it, but it says that we are born without asking and die without knowing. So, a meal and between and the other, we have to do our best and make life best and just be ourselves. Yes. Those are good, practical steps. Just knowing first, hope in our own selves and just realizing that there is another day, there is a tomorrow, there really is light that you can find, a little crack in the window, in the dark room that you may be in and once you get a hold of that light, once you get a little glimpse of it, then you can start leading someone else to it as well. To everyone that’s going to be hearing this, don’t take a moment like say, I don’t know what you’re going through, you don’t know what I’m going through, we don’t know what anyone else is going through and sometimes we just think that our problems are the worst things in life. But, that doesn’t mean that just because someone’s having a bad day, just because someone’s having worse than you that you’re not going to be happy because someone else is better than you. It’s like the two sides of the coin. If you see yourself and it’s really bad, if your problems are like the most horrible problems in the world and you are not able to handle it, stop, think and sometimes hope comes from another person. We just need to extend our hand and as for help. That’s what most people don’t do. I don’t do it. I know how hard it is when you have the pride. You don’t want to ask someone for help, but sometimes help is just a word. Somebody comes to you and talk to you a little bit and get refreshed, get showered with that good energy and then be able to follow and see things and follow through and go ahead and keep working. Yes. That’s good. Just asking for help. Man, that is so practical because it is so hard to admit that I need help. It is. It is super hard to do. Some people say, no, I have too much pride to ask for someone to extend a hand for me. That’s the thing, if you are able to give help, you can get help too. Yes. Nice job. Nice job. So, last question on the way out. Just for fun. What do you listen to when you want to feel more hope or happy or have some fun, what are you going to crank up in your earbuds? There is Hope and who I the artist? India Arie. I got her. Yes. India Arie. I think the other one that’s more recent is The Script. The song is called “Superheroes”. Yes. The video of the song, there’s something about you look at you. That’s true. There’s a difference when the people went through there, they went through a bad situation, they had to reroute yourself and make it going and going. You keep your dreams up and you keep your hope to get it right because that’s how we do it. We hope to get it right always. The video and the song just show how hard people work and how we don’t know what they go through. But I’d say all kinds of music. Sometimes when I get home I just sit down and look at my dog, look at my wall and start listening to some music and fly back to my childhood stories and think of everything that happened to me and how I got here. It’s a long way. They say life is short, life is not short. Life is long and it’s a long and nice book. You just need to try to write it the best we can because we read as we write, so sometimes it can change, and sometimes it can’t. Wow. We read as we write. You got some great quotes. Yes. That came out right now. Yes. Actually, talking to you is getting me smarter. Man, that’s awesome, so you just came up with your own quote. That was really good. I’m going to write it down so I don’t forget. What are you talking about? I’m writing it down, so it’s my quote now. J We read as we write. That’s a good quote.